These Shell photo frames brings all your childhood memories by providing attractive Shell Photo frames where you can make your pics more beautiful by adding text and changing effects.. Shell Photo frames make gorgeous party favors. Decorative beach themes photo frames make great gifts for friends or use for your own family or vacation memories!! * The Best and easiest Photo Frames. * HD Quality for your viewing pleasure. * Adjust position, size, angle of your photo by just finger gestures. * Give a attractive appearance to your selfies. * You select photo from camera and gallery and make your photos attractive. * Also you can add text to your image and also send this image with your friends or families through social app. * Save images to SD Card or our app gallery. * Set images as wallpaper. 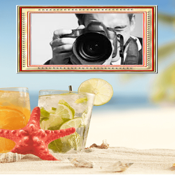 * Shell photo frames is totally free. * HD and glittering graphics and nice collection of frames. * Easy to use and understand. * Edit Photo With Creative Sdk Tool Library. * Set your new awesome insta pic as wallpaper. * Save your framed photos into your SD card. * Choose Various types of Stickers and Emojies. * Select different types of overlays on photo like square,rectangle,pyramid,hexagonal and etc. * Also Apply Vignette on your photo. * Crop photo by square,custom,2:3,3:4,3:5 etc. * change orientation on photo by rotate and flip horizontal and vertically. * Apply lighting Like Brightness,contrast,highlights,shadows. * apply color effect like saturation,warmth,tint,fade. * Apply Sharpness on your creation. * Also apply splash effect like free color,smart color,and eraser. * draw free hand pan by different color. * add text on your photo by different color and text size. * Apply Redeye effect on the photo. * apply whiten effect on the photo. * apply Blemish effect by photo editor.